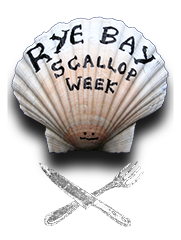 Fresh from Rye Bay succulent scallops with a hint of lemon make this perfect pasta dish for lunch, dinner or entertaining. Cook the linguine in boiling,lightly salted water until al dente and drain. While the pasta is cooking, grate the zest and squeeze the juice from l lemon. Whisk the lemon juice and olive oil together in a small bowl stir in the chile and half of the flat leaf parsley. Season with salt and pepper. Toss the lemon mixture with the linguine. Heat a heavy frying pan or ridge grill pan over high heat. Brush the scallops with olive oil. Season with salt & pepper. Add to the pan and sear the scallops for 1 minute each side. Divide the linguine between 4 serving plates and arrange the scallops on top sprinkle with parsley and lemon zest. Serve with lemon wedges.